In this episode I am joined by Thadeous Cooper and we build a one shot adventure to show a bit of how such things can be done. What's more, I edited together all our ideas and am providing them for free. It's a short PDF in the post just before this one and I hope you download it, consider running it, and give me feedback on it. Here is the PDF of the One Shot Halloween adventure that I made with my guest in episode 155. Enjoy The Mansion of Madness! MasterPlan is D&D software with a lot of help for DMs to get their game organized. I've been accused of not paying any attention to this program, so to prove that I have nothing against it I called in Andy Aiken, creator of MasterPlan to tell us all about it. In this episode I interview R.A. Salvatore about his latest Drizzt novel, Gauntlgrym. I also had Chad Sutton from the Lords of Tyr podcast join in for a review of the book. This is Stop One on the official Gauntlgrym blog tour for Mr. Salvatore and it comes with a contest and some really fantastic prizes to boot. See below for your first chance to win. D&D Official Website - It has come to my attention that since recording this episode the novel survey has been removed, sorry guys! 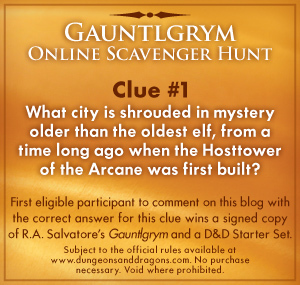 FROM WIZARDS OF THE COAST: Visit all the stops during R.A. Salvatore’s week-long Gauntlgrym online tour to find the seven other clues. 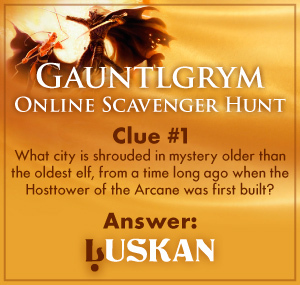 At the end of the online tour on 10/22/10, put all the clues together, be first to solve the riddle and tweet about it, and win a signed copy of Gauntlgrym and a trip for two to D&D Experience in Fort Wayne, IN. You must include @Wizards_DnD and #gauntlgrym in your tweet. Riddle-solving tweets won’t be accepted until 12:01 a.m. EST on 10/22/10. Basic Set (Red Box), Heroes of the Fallen Lands, Rules Compendium, and Dungeon Tiles Master Set: Dungeon are the topic of conversation. And joining host, Jeff Greiner, in this episode are Tracy Hurley from Sarah Darkmagic, Jared Glenn from the Power Source, and Samuel Dillon from RPG Musings. 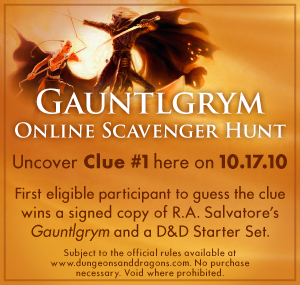 Don't forget to swing by in a couple of days (October 17th, 2010) for a special episode with R.A. Salvatore where you can win all sorts of prizes. Geoffrey D. Winn interviews Don Bassingthwaite about his Eberron trilogy, the Legacy of Dhakaan, a series that centers on Eberron's hobgoblin society and involves some pretty massive world-shattering events. I also mention some news about the October 17th, 2010 episode that I will be releasing about the Gauntlgrym/R.A. Salvatore. There's a prize give-away and exclusive coverage and The Tome Show is a part of the party. Check out the information below and I look forward to seeing you on the 17th!